The rise of a sensory style? I ended my last post, on colors, by speculating that the best explanation for the rise of color vocabulary from 1820 to 1940 might simply be “a growing insistence on concrete and vivid sensory detail.” Here’s the graph once again to illustrate the shape of the trend. It occurred to me that one might try to confirm this explanation by seeing what happened to other words that describe fairly basic sensory categories. Would words like “hot” and “cold” change in strongly correlated ways, as the names of primary colors did? And if so, would they increase in frequency across the same period from 1820 to 1940? “Hot” and “cold” track each other closely. There is indeed a low around 1820 and a peak around 1940. “Cold” increases by about 60%, “hot” by more than 100%. “Warm” and “cool” are also strongly correlated, increasing by more than 50%, with a low around 1820 and a high around 1940 — although “cool” doesn’t decline much from its high, probably because the word acquires an important new meaning related to style. “Wet” and “dry” correlate strongly, and they both double in frequency. Once again, a low around 1820 and a peak around 1940, at which point the trend reverses. There’s a lot of room for further investigation here. I think I glimpse a loosely similar pattern in words for texture (hard/soft and maybe rough/smooth), but it’s not clear whether the same pattern will hold true for the senses of smell, hearing, or taste. More crucially, I have absolutely no idea why these curves head up in 1820 and reverse direction in 1940. To answer that question we would need to think harder about the way these kinds of adjectives actually function in specific works of fiction. But it’s beginning to seem likely that the pattern I noticed in color vocabulary is indeed part of a broader trend toward a heightened emphasis on basic sensory adjectives — at least in English fiction. I’m not sure that we literary critics have an adequate name for this yet. “Realism” and “naturalism” can only describe parts of a trend that extends from 1820 to 1940. More generally, I feel like I’m learning that the words describing different poles or aspects of a fundamental opposition often move up or down as a unit. The whole semantic distinction seems to become more prominent or less so. This doesn’t happen in every case, but it happens too often to be accidental. Somewhere, Claude Lévi-Strauss can feel pretty pleased with himself. 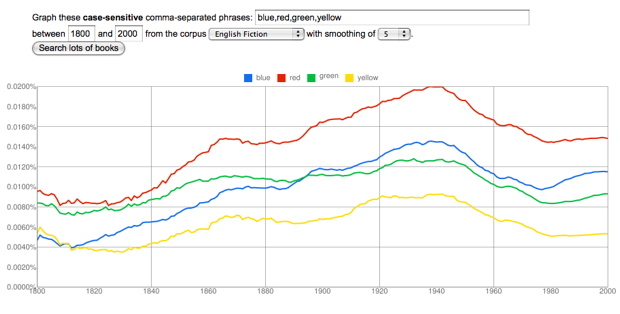 This entry was posted in 19c, 20c, ngrams, Uncategorized by tedunderwood. Bookmark the permalink.